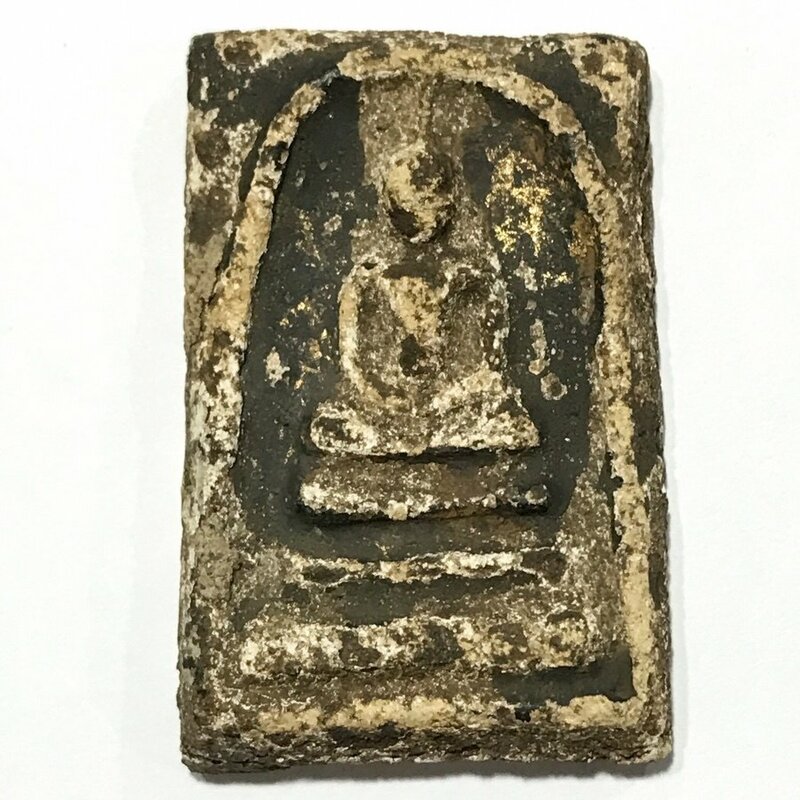 Pra Somdej Wat Rakang Banju Kru Wat Kanlayanamit Pim Yai Jarod Sum Chang Luang Wijarn 'Lang Bang Suan' (Kraap Kru partially cleaned, partially Intact) votive tablet of Somdej Dto, from the Wat Kanlayanamit Hiding Place Find. Pra Somdej Kanlayanamit can be found in both cleaned and uncleaned (of Kraap Kru Residues) versions, according to preference. If uncleaned, is called 'Mai Lang' and if the amulet has been cleaned, is called 'Lang Laew', or Partially Cleaned 'Lang Bang Suan'. A Sacred Classic that was for over a Century only available in our dreams, and to the Wealthy, that has returned to Grace the World Stage of the Amulet World; The Pra Somdej Wat Rakang Pim Yai Banju Kru Wat Kanlayanamit, of Somdej Pra Puttajarn (Dto) Prohmrangsri. This exhibit is Pim Yai Gaes Jarod Sum Niyom large Pim, from the artisan Chang Luang Wijarn, with visible Kraap Kru residues, gold leaf and laquer stains on front face, with visible parts of Muan Sarn Clay protruding where the lacquer has worn off over the century and a half in the Kru. The rear face has thick lacquer on some parts, with larger areas of visible Muan Sarn clay for examination under the eye loupe, which we shall present with macro images further down in this article. This exhibit is 'Nuea Jad Jaan' dry granular surface texture, with the ubiquitous lacquer and gold leaf visible through the Kraap Kru residues formed on the surface through storage in the hiding place chamber of the Chedi. Once unheard of, and for some years disputed, the Pra Somdej Wat Rakang Wat Kanlayanamit has become one of the two most sought after amulets of Somdej Dto in the current Era, after many decades where it was impossible to find an authentic Somdej Wat Rakang, due to the till then accepted models being limited to 9 or 10 Pim (designs), which were the only ones accepted by the then undisputed and monopilistic societies. The Pra Somdej Wat Rakang Kru Wat Kanlayanamit is along with the Pra Somdej Wat Rakang Kru Wat Sadter, equally favoured and fervently collected by devotees of Somdej Dto Prohmrangsri, and both hiding place finds. The 'Nuea Ha' visual content of the Muan Sarn Clay differs from that found in the Pra Somdej Wat Rakang Kru Wat Bang Khun Prohm, and the Pra Somdej Wat Rakang of Wat Sadter, in the sense that both of those Kru chambers were 'Kru Piak' (endured floods), and the Kru Wat Kanlayanamit find amulets came from a 'Kru haeng' (dry chamber). Hence, the appearance of the Muan Sarn clay is 'Nuea Jad Haeng', dry and coarse surface effect. The amulets were treated with lacquer and gold leaf on most versions, which becomes more visible in models which devotees have cleaned off the Kraap Kru residue, which builds up on the surface of hiding place amulets over decades and centuries. The Kru Wat Kanlayanamit amulets were given Nuclear testing for determination of their true age by navy commander Navee Santikanawin, by means of both carbon dating and also through chemical testing, which cost the destruction of three amulets to make enough substance for testing, and the results came out that the amulets were determined to have been made somewhere around 2388 and 2413 BE (2401 BE Plus or minus 13 years), confirming the right age for them to have been made by Somdej Pra Puttajarn Dto Prohmrangsri. The tests were made at the National Institute of Nuclear Technology. The fact that the Pim, which were found, are also recognizable as being from the Chang Sip Moo artisans who made the block presses of the Pra Somdej Wat Rakang. The Pra Somdej Kru Wat Kanlayanamit hiding place amulets were found inside the Chedi Stupa at the temple in the year 2551 BE, with a large number of amulets of various Pim Song designs, mostly being Pra Somdej Pim Yai, Pim Sen Daay, Pim Thaan Koo, Pim Chedi, Pim Prok Po, Pim Ok Krut, and Pim Thaan Saem. There were also some smaller numbers of other amulets found, such as Pra Sangkajjai, and Pra Sayasana (reclining Buddha), as well as some votive tablets composed of nine Pra Somdej stuck together in a clump, and some Somdej Koo twin Pra Somdej stuck together 'Siamese Twin' style. Various other unusual models were found but only in very small numbers. At first after the find, the amulets were heavily criticised by the 'Sian Pra' , who were in those days still limited to a group of afilliated monopolist Bankokian amulet scene speculators and auctioneers, who used their self published works to establish a highly limited pantheon of 'accepted', which were limited to 8 0r 10 specific models of Pra Somdej amulets. A famous example story which reveals how the old school method and manipulation of which amulets qualify for authenticity, was both small minded, short sighted and in many cases, completely erroneous. The story is a story which many people can tell, for it has happened many times in the past, where a devotee took an amulet to a 'Sian Pra' (established famous amulet auctioneer/speculator/buyer-seller), who would look at the amulet and say 'does not pass the test'. When the devotee asked the Sian Pra why, he said; 'Because the Pim' (exact design features). How stupid a method of authenticating the amulets it is, to just look at the design of the front face of an amulet, and not look at the age and ingredients of the Muan Sarn clay! In the below image for example, the trained, and even lesser trained eye, can see the sheer age of the amulet from how dense, and dry the Sacred Clay is, and how well affixed the ancient lacquer and gold leaf has become one with the Sacred Clay during over a Century and a Half of aging. It is known to anybody with any true knowledge, that the old masters, including Somdej Dto, all made many more amulets than nine or ten simple designs, and to try to restrict a pantheon to only those which your teachers taught you, and deny any designs you do not know or have not encountered, even if the Sacred Clay shouts out the name of its maker, is complete idiocy. 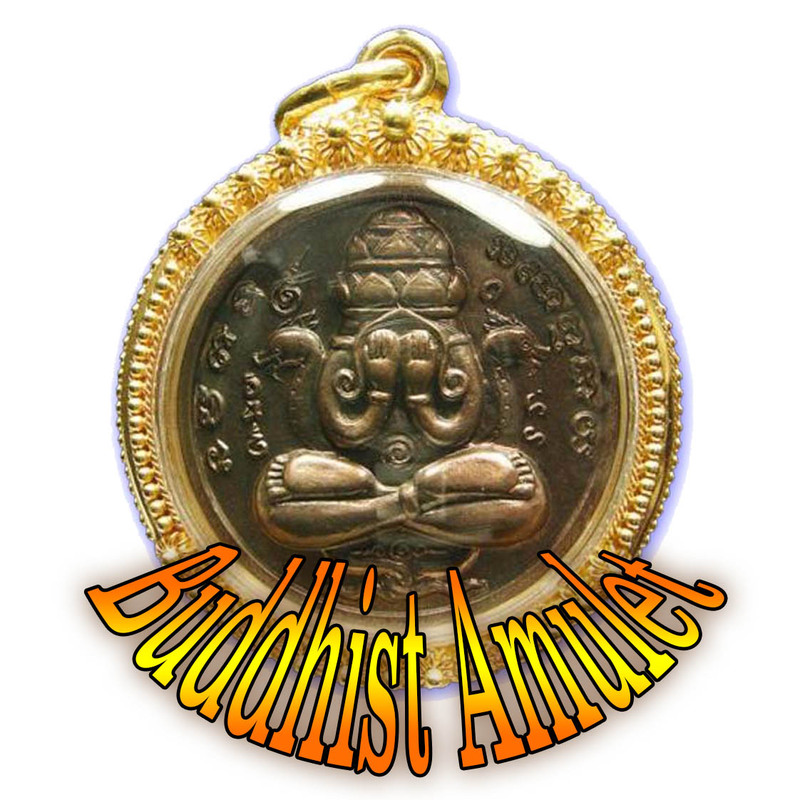 This method of examination and confirmation is however now becoming highly outdated and the amulet world in Thailand is waking up to see a host of yet to be properly documented and accepted amulets of great Masters, which were never paid attention to by the pre-internet generation of collectors and speculators. However, local devotees of temples always had more knowledge of the amulets of their local Masters than the Bankokian 'Sian Pra' so called experts, for they and their forefathers are the closest connection to the Master, not the Sian Pra from Bangkok. The old school method of only looking at the design of an amulet, but ignoring the clay, from a Master whose Muan sarn clay is known to be inimitable, and to be the best way to see if it was made by Somdej Dto or not, is completely illogical. This is a fact that has finally become obvious to the general public, and the era of the handful of famous auctioneer monopolists is over, and the truth of the fact that the Pra Somdej Wat Rakang of Somdej Dto was placed in many hiding places around the country, and that not all of his amulets are in the hands of the old school monopolists, which is a fact they have not conceded with joy, but are now having to accept. Proof of this is that many of the auction magazines owned by these old schoolers are now presenting the amulets they once denied, in their auction rooms, so they are 'getting in on the show, by remaining silent about their past criticisms, and just placing the amulets they once turned away from, up for auction. Hence, the Pra Somdej Kru Wat Kanlayanamit amulet is now an accepted competition class amulet which can be entrered for competition and/or certification with many associations, and any true student of the amulets of Somdej Dto, whose eyes are trained, can confirm for himself the authenticity of the Muan Sarn and the Pim, with great ease. One could say that the Pra Somdej Wat Rakang of Wat Kanlayanamit and Wat Sadter could be called 'Prodigal Sons' for indeed, they are like long lost loved ones who have returned from a long time away from sight. It is a joy for the devotee of Somdej Dto to encounter a replenished supply of available authentic Pra Somdej Wat rakang of Somdej Dto available for Bucha, at proces which are far below the price of those Pra Somdej Wat Rakang, Wat Gaes Chaiyo, and Somdej Kru Bang Khun Prohm, which have dominated the scene for the last 10 decades. We highly recommend both the Pra Somdej Wat Rakang Kru Wat Kanlayanamit and the Kru Wat Sadter amulets, for we believe that their affordability will not last for many years, and that they too will eventually become as unaffordable as their long time accepted peers from Wat Rakang and Wat Bang Khun Prohm and Wat Gaes Chaiyo. For this reason, one can expect both of these Pra Kru Somdej editions to eventually deplete and become priceless classics of millionaire status within a period of perhaps a decade. As a result, in the day and age when a true Pra Somdej Wat Rakang Kositaram of Somdej Pra Puttajarn (Dto) Prohmrangsri would otherwise be impossible to find, or at least impossible to afford, the Pra Somdej Wat Rakang Kositaram Banju Kru Wat Kanlayanamit amulets are easily authenticated by any observant eye the 'Nuea Ha' (visual content) being identical to the Pra Somdej Wat Rakang Kositaram of Immortal Fame we all know and revere (and wish for). 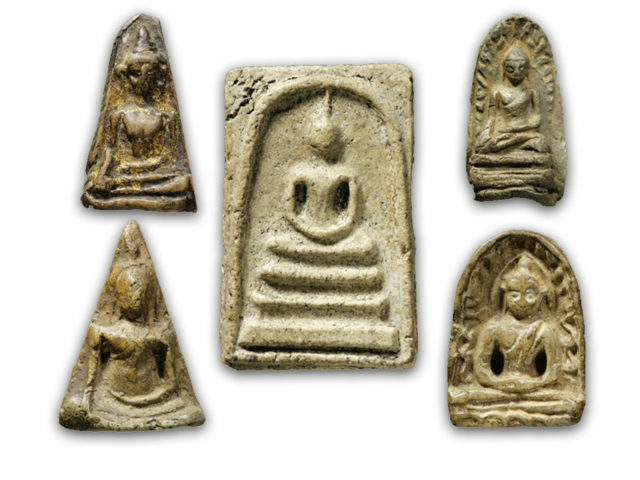 The Pra Somdej Wat Kanlayanamit amulet find batch were hidden in a chamber of the Chedi Stupa at Wat Kanlayanamit, which never experienced flooding, and allowed the amulets to remain very dry, resulting in a much more granular texture to the surface of the clay, and for the lacquer and gold leaf beneath the residues to remain intact, whereas the Pra Somdej Amulets of the Kru Wat Sadter Hiding Place Find, were hidden in the Kru immersed below the water level for a very long time, which caused the original 'Rak' lacquer which covered many of them to wear out and detach from the surface of the amulets. This resulted in both the Kru Wat Kanlayanamit and also the Kru Wat Sadter Sacred Pra Somdej amulets, each possessing their own inimitable appearance, which differs from the Pra Somdej Wat Rakang Kositaram, due to the long time period spent under different atmospheric conditions, with high moisture and humidity. The result in both batches is a very eye catching and Sacred appearance which has only served to increase the depth of study content when examining the various features and aspects of the Muan Sarn Sacred Powders (ageing, contraction, ingredients, hardness, density, surface texture). The rear faces are found with varied appearance, depending on whether they were laid on a Mai Gradan (blackboard) which leaves ridged lines on the back face, or if they were laid on stone or other surfaces to dry after they were pressed, which leaves a smoother surface, or even a porous holed surface. Precisely these patterns are evident on the Pra Somdej at Wat Rakang Kositaram, and are found to be identical to those in the Pra Somdej Kru Wat Kanlayanamit and the Kru Wat Sadter amulet find. This is the reason for the fact that the red, or black lacquers found on the surface of the amulets found at Wat Kanlayanamit are intact, in most examples, with broken lacquer on some exhibits which have been cleaned by devotees, or which were later exposed to water during a later time. But the Somdej Kru Wat Sadter, in most cases have less lacquer than the Wat Kanlayanamit find batch, that is flaked off from exposure to water. The remaining bits of lacquer which can be found visible in lesser or greater amounts on the amulets is extremely dry and hermetically attached to the surface of the amulets, from over a Century and a Half in burial. In the Wongarn Pra Niyom Amulet Aficionado circles, this is called 'Nuea Rak Dtaay' meaning 'the lacquer has passed away'. This is used to refer to the effect of the laquer breaking off leaving stains in a crackled pattern, that lends an effect to the surface of the amulets, and only serves to enrichen its character and eye- pleasing effect. Some exhibits remain with highly evident lacquer traces, whereas others have been cleaned at some point (some devotees would clean the amulets, others would leave them in their natural state, according to personal preference). Below; one of the very rare exhibits found in the Kru at Wat Kanlayanamit in Pim Sayasana (Reclining Buddha) posture. The Muan Sarn is a wondrous thing to examine under the eye loupe, and with extensive perusal, will slowly but surely reveal the inner secrets of the many ingredients within its Muan Sarn Sacred Clay, as the eye becomes ever more fine tuned to gazing into the depths beyond the surface with increasingly subtle insights arising regarding the composition of the Sacred Clay of the Pra Somdej Wat Rakang Kositaram amulet of Somdej Pra Puttajarn (Dto) Prohmrangsri. For the Group who revere the Pra Somdej Kru Wat Kanlayanamit amulet as that of Somdej Pra Puttajarn (Dto) Prohmrangsri Wat Rakang Kositaram, we are beholding an Eternal Classic, and one of the most Sacred Amulets, which has blessed us by escaping the clutches of the speculative investors, and is affordable within the reach of most people who seriously seek the honour of wearing and revering what well studied aficionados accept to be a true Pra Somdej Wat Rakang Kositaram of the Great Somdej Pra Puttajarn (Dto) Prohmrangsri.